Welcome to the newest addition of Fandomental activities. 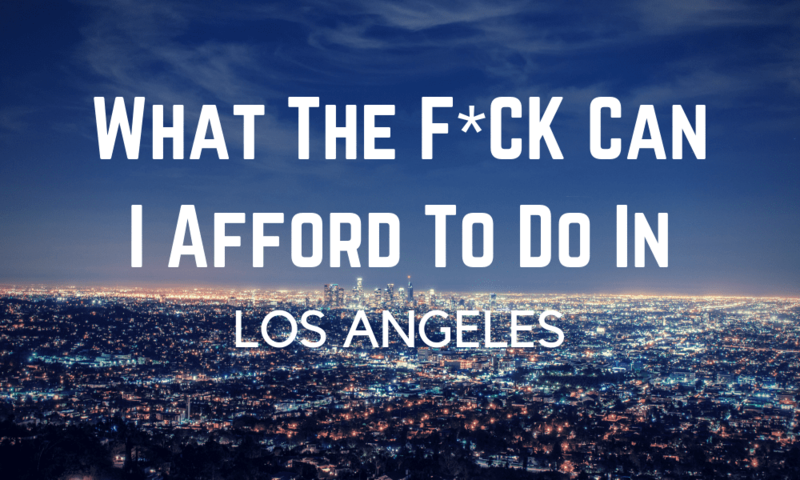 We’ve often seen folks asking what there is to do in cities that doesn’t revolve around drinking or the club scene… but is still within the realm of affordability. Fear not, fellow Fandomentals! Well, at least those of you living in Los Angeles. We’re rolling out a Fandomental curated weekly list of events that range from culture to sports and fit several budgets. As we continue to hone and fine-tune this list, look for other “weekly suggestions” to pop up for a city near you! LAFC will take on Real Salt Lake at the Banc of California stadium, on Saturday, March 23, at 7:30 pm. Tickets are a little pricier for this match-up, starting at $51 for standard upper rows, though you might squeak out $49 for resales. Lakers fans have two home games (from the STAPLES Center) to choose from this week. First, the Lakers take on the Brooklyn Nets on Friday, March 22, at 7:30 pm. Then the Lakers face the Sacramento Kings on Sunday, March 24, at 6:30 pm PST. Remaining tickets for the Nets game begin at $68.00, and tickets for the Kings game start at $76. Definitely on the “special occasion” end of the spectrum on pricing this week. Clippers fans only have one homes game this week (also from the STAPLES Center) when the Clippers will play the Indiana Pacers on Tuesday, March 19, at 7:30 pm. You can currently grab upper-level seats for a much more wallet-friendly $17-20. Downtown Independent LA is showing a double feature of 2008’s In Bruges and 2014’s Calvary. Tickets are $12 and the feature begins at 7:00 pm. The LACMA‘s Tuesday Matinee series continues this week with a screening of Willy Wonka and the Chocolate Factory at 1:00 pm. Tickets are $4 for the general public. Downtown Independent LA will run Chen Kaige’s Legend of the Demon Cat starting at 6:00 pm. Tickets are $12. And as a regular staple for the Landmark Nuart Theatre, don’t forget The Rocky Horror Picture Show runs at midnight! Tickets are $14. From March 21 through the 24, the Los Angeles Women’s International Film Festival will be running at the LA Live Regal Cinemas in downtown LA. Tickets start as low as $15. Culver City’s Thinkspace Projects currently displays art exhibits from Kevin Peterson and Frank Gonzales. Go check their website to read about each artist’s show pieces. The Cagematch– This live comedy performance on Wednesday, March 20, begins at 11:00 pm with tickets selling for $7 at the door, or $8.50 (with processing fees) online. The “Pasadena Plague” aka a trio of comedians play host to two improv comedy teams fighting head to head to see who reigns supreme. Queer World – Over at UCB’s Sunset location, an all-queer team of performers takes the stage at 10:30 pm on March 20. If you’re tired of putting up with too much hetero in your comedy, this is definitely the show for you. Tickets are $7 at the door or $8.50 (with processing fees) online. Fans of symphonic metal rejoice (if you’ve been living under a rock or are, you know, just busy with life) as legends Within Temptation, along with In Flames, make their performance stop in Los Angeles. Playing on Tuesday, March 19, tickets start for as low as $29.50, and doors open at 6:00 pm. Celebrating her latest album, “On the Line”, Jenny Lewis will be performing at the Hollywood Amoeba on Friday, March 22, at 4:20 pm. To guarantee a ticket to the show, you must swing by Amoeba to purchase a copy of the album.